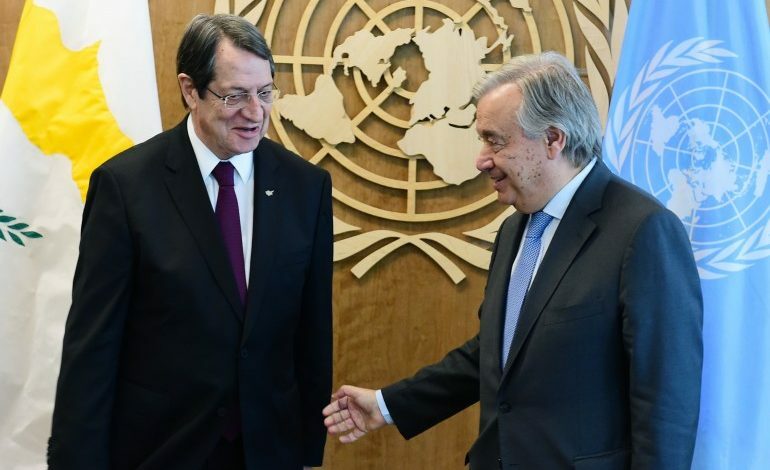 Prospects for a comprehensive settlement in Cyprus “remain alive”, United Nations Secretary General Antonio Guterres has told the members of the Security Council in his report on his good offices mission which was submitted to them on Monday. He announces that he will instruct his envoy Jane Holl Lute to continue discussions to gauge the true extent of convergence on key issues and the willingness of the sides to incorporate novel proposals as part of an overall solution toward a common future that they themselves can envisage. “I observe clearly that continued support for a horizon of endless process without result lies behind us, not before us,” he notes. “I believe that all Cypriots deserve a common future that one thing alone can bring: a lasting agreement achieved within a clear horizon,” he stresses. “I also acknowledge that new ideas may additionally be needed in order for a fresh effort to bear fruit,” he adds. “In view of what I understand to be the sides’ interest to engage in such an effort, and before formal negotiations should be launched, I will instruct Ms. Lute to continue discussions to gauge the true extent of convergence on key issues and the willingness of the sides to incorporate novel proposals as part of an overall solution toward a common future that they themselves can envisage, ” he notes. “It is my hope that these discussions can lead, once again, to the deployment of the full weight of my good offices in what may prove a lasting resolution of the Cyprus issue,” he concludes.